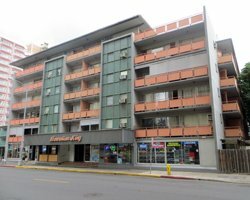 Non-Beach Waikiki Hotels: Deals & Details in central Waikiki. 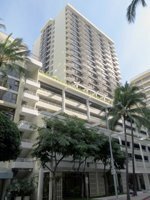 Central Waikiki Hotels for Your Hawaii Vacation! 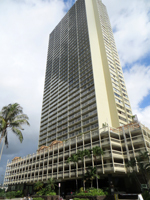 This page is specifically about the Waikiki hotels that are located in the central portion of Waikiki, but not directly on the beach. 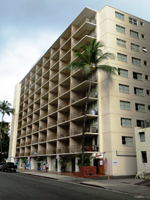 These hotels are conveniently located with relatively easy acces to all the Waikiki attractions and events. They’re also closest to the shops and restaurants in and around the Royal Hawaiian Shopping Center. Click one these links if you want to see my reviews of the Waikiki Beach resorts and/or non-beach hotels in northwest and southeast Waikiki. 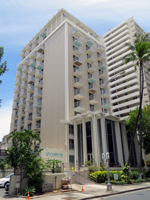 Only the Outrigger Reef Hotel stands between the Embassy Suites Waikiki and Waikiki Beach. Just a one or two minute stroll along the edge of Fort DeRussy Park and you’ll have sand between your toes. You might appreciate easy access to the Army Museum of Hawaii, beach volleyball, and other activities in the nearby Fort DeRussy Park. Or maybe you’ll prefer the fact that you’re just two short blocks from the shops and restaurants at the Royal Hawaiian Shopping Center. Because Embassy Suites is one of the many Hilton hotel brands, this property will appeal to most Hilton HHonors program members. Then because this hotel is in a great location and all guest rooms are suites, I’d say it’s also well suited to dream vacationers and family vacationers. Check Rates and Availability at Hotels.com (ad). Hawaii Vacations: Save 30% or more in paradise! : search keyword "Imperial Hawaii". Only the Halekulani Hotel stands between The Imperial Hawaii Vacation Club and the sands of Waikiki Beach. 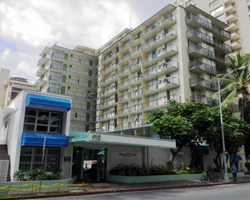 Yet in spite of this great location close to the beach and within two short blocks of the Royal Hawaiian Shopping Center, this property could have just as appropriately been listed among the Waikiki hotel deals below. Better still… many of the rooms are suites. The trade-off, however, is that this property is starting to look a little old. Furthermore, many of the guest units have been sold as timeshares. 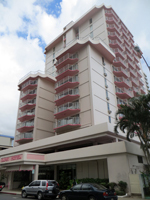 Nevertheless, the budget-friendly room rates* and a great location make The Imperial Hawaii suitable for both family vacationers and bargain hunters. Check Rates and Availability at Hotels.com (ad). Hawaii Vacations: Save 30% or more in paradise! : search keyword "Waikiki Parc". 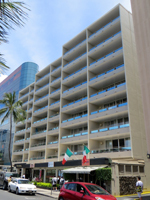 The Waikiki Parc is an urban chic boutique hotel that’s affiliated with the much pricier Halekulani Hotel directly across the street. 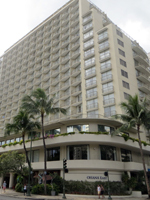 With only Halekulani separating it from the beach and less than two short blocks between this hotel and the Royal Hawaiian Shopping Center, I’d say it’s in a great central Waikiki location. But other reasons to consider this hotel have more to do with value for your money than where it sits. I’ve heard that this hotel offers free admission to the Bishop Museum and the Honolulu Museum of Art – a nice perk for visitors. And if you want to learn to surf during your Hawaii vacation, the Waikiki Parc makes it convenient through a partnership with the Hans Hedemann Surf School. Thus, this hotel is well suited to dream vacationers and some family vacationers. Check Rates and Availability (ad): Escape to Hawaii. Stay 4 nights at Holiday Inn Resort, an IHG hotel, get 5th night free. Just a quick stroll across the street and along the side of the Outrigger Waikiki and you’ll be on the sands of Waikiki Beach near several surfboard rental outfits and one of the best beginner surf breaks on Oahu. 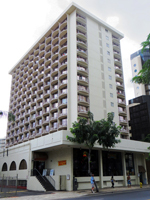 This Holiday Inn Resort is located directly across the street from the shops and restaurants at the Royal Hawaiian Shopping Center. And if your Hawaii vacation coincides with any of the parades or block parties that I’ve identified on the Hawaii event calendar, you’ll have front row seats for all the action happening below from the the comfort of your table at the poolside bar. In fact, some of the photos on this site were taken from those very tables. The Beachcomber is one of the central Waikiki hotels I visit most frequently, and I’d say it’s very suitable for family vacationers. Check Rates and Availability at Hotels.com (ad). Hawaii Vacations: Save 30% or more in paradise! : search keyword "Kaiulani". I’ve already featured the Sheraton Princess Kaiulani because of the incredible gingerbread village the hotel chef builds every December. But there are 11 more months in a year, and I think there are at least a few other good reasons to consider staying at this property. Although not quite inexpensive enough to list this among the cheap Waikiki hotels, the Princess Kaiulani is still value-priced in my mind because of the great location and service/amenity standards that go hand in hand with the Sheraton brand. And even though it’s not directly on the sand, it’s practically just across the street with direct ocean views and easy beach access. For that reason, I’d say this hotel is well suited to family vacationers; and it could also be appropriate for some dream vacationers and bargain hunters. Check Rates and Availability at Hotels.com (ad). Hawaii Vacations: Save 30% or more in paradise! : search keyword "Kuhio Banyan". As far as I know, the Kuhio Banyan Club has been converted to a hotel from studio apartments. Thus, the rooms have kitchens, and everything seems a bit old. Basically, the value price and central location are the main reasons I see for choosing this hotel. Otherwise, it’s a fairly long two blocks walk from the beach; and it’s surrounded by the other discount Waikiki hotels, so it doesn’t really seem to have any other key advantages. Search the address using the Google Maps Street View feature, and if all looks fine, you might choose this hotel as a bargain hunter. Check Rates and Availability at the Hawaiian King Homepage. Did I say the last place seems old? That’s just because I hadn’t yet gone around the corner to the Hawaiian King. As far as I know, this property still is an apartment building… with only some of the units designated for use as hotel rooms. It’s located approximately two long blocks from Waikiki Beach; and – a possible perk – this is the only hotel I know of that offers free surfboard use. That could be good or bad depending on how old or new, big and heavy the surfboard(s) actually are. Search the address using the Google Maps Street View feature, and if all looks fine, you might choose this hotel as a bargain hunter. Check Rates and Availability at Hotels.com (ad). Hawaii Vacations: Save 30% or more in paradise! : search keyword "White Sands Honolulu". In case it isn’t obvious in the photo, the White Sands Hotel isn’t exactly the newest lodging option in Waikiki. Yet for some reason, it still looks cozy to me – perhaps because it reminds me of the kinds of motels I used to stay at when I was a little kid. It also reminds me of the kind of place where I imagine cold-climate retirees might go to live throughout the winter months (although I’m not specifically aware of anybody who does this). Anyway, it’s located approximately two long blocks from Waikiki Beach; but it’s on a relatively quiet side street near the Ala Wai Golf Course. Some guest rooms have kitchens. Otherwise the only obvious selling point is the price; which makes the White Sands suitable for bargain hunters (and my imaginary retirees). Check Rates and Availability at the Holiday Surf Homepage. The Holiday Surf Hotel is located just around the corner from the White Sands; and it also looks cozy to me. It’s located even farther from Waikiki Beach; but it looks out directly over the Ala Wai Canal and Golf Course with a beautiful view of the mountains. As far as I know, all the guest rooms are studios with kitchens. Thus, between the scenery and amenities, it seems to me that you’re getting more value for less money. That’s why the Holiday Surf seems well suited to bargain hunters. Check Rates and Availability at Hotels.com (ad). Hawaii Vacations: Save 30% or more in paradise! : search keyword "Aloha Surf". The Aqua Hospitality group is the other major local hotel brand. Better still… Aqua has a greater number of properties, and many (if not all) of them have been recently renovated with a nice variety of improvements. As a result, I’ve really grown to like and appreciate the Aqua brand. 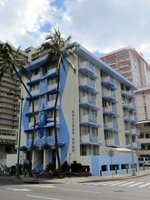 For example… the Aqua Aloha Surf seems to be your basic budget-friendly Waikiki hotel; but it distinguishes itself by offering free continental breakfast – a rare deal in Waikiki. 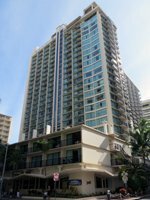 It’s located almost two long blocks from Waikiki Beach; but it also has nice views out over the Ala Wai Canal and Golf Course to the scenic mountains of Oahu. This hotel is well suited to bargain hunters and some family vacationers. 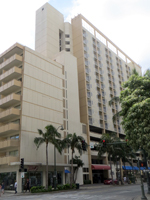 Formerly called the Ohana West, Hilton Garden Inn is located in just about the exact center of Waikiki – approximately 1.5 blocks from the Beach and close to shops/restaurants. I haven’t had occasion to visit this hotel since the change of management. 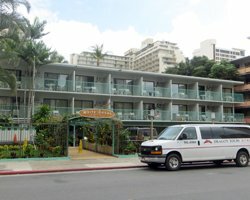 Nevertheless, it was one of the nicest value hotels in central Waikiki before. Now that Hilton is involved, I expect that the experience has probably improved. This hotel is well suited for family vacationers. Check Rates and Availability at Hotels.com (ad). Hawaii Vacations: Save 30% or more in paradise! : search keyword "Outrigger Regency". I’ve commented elsewhere that I like the Outrigger hotels because they’re a local brand that treats local residents well. I’m assuming they treat visitors equally well. However, when it comes to the Outrigger Regency, I’d probably skip right past it and go stay at the Outrigger Reef Hotel just half-a-block down the road. The reef is located right on the beachfront and I’ve found cheaper room rates* there. Anyway, the Regency on Beachwalk is a little more than half-a-block from the beach, and it’s just one short block from the wide open spaces and activities at Fort DeRussy Park. It’s suitable for family vacationers. 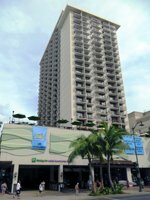 The Hokulani is located approximately one long block from Waikiki Beach and directly across the street from the shops and restaurants at the Royal Hawaiian Shopping Center. Being situated on the “main drag” through Waikiki, it gives you front row seating to most of the Kalakaua Avenue parades and block parties featured in my Hawaii event calendar. Everything about this hotel seems very modern and classy. Because it’s a Hilton, it will appeal to most Hilton HHonors program members. And because all the rooms are suites, it will be suitable for many family vacationers and dream vacationers. Check Rates and Availability at Hotels.com (ad). Hawaii Vacations: Save 30% or more in paradise! : search keyword "Aqua Oasis". 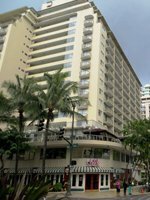 The Oasis is located approximately 1.5 blocks from Waikiki Beach near Fort DeRussy Park, and it’s just half-a-block from the shops and restaurants at the Royal Hawaiian Shopping Center. Better still, it’s in a great location if you’ll be here for any of the block parties and parades that frequently run down the middle of Kalakaua Avenue. I don’t know if the name change means it has been recently renovated (like so many other Aqua hotels), but I will say that it looks like a nice, modern boutique hotel. And fortunately, there doesn’t appear to have been any rate* increases as a result of the new name. If not for the seasonal price fluctuation in sample rates*, the Oasis might also have made my list of cheap Waikiki hotels. Thus, I’ll say this hotel appears to be suitable for family vacationers and some bargain hunters. Check Rates and Availability at Hotels.com (ad). Hawaii Vacations: Save 30% or more in paradise! : search keyword "Ohana Malia". If it wasn’t for seasonal price fluctuations, the Ohana Waikiki Malia could’ve also made my list of budget-friendly Waikiki hotels. It’s located a bit more than two long blocks from Waikiki Beach; and it’s close to shops and restaurants. 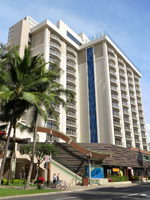 Like the other Ohana hotels, it seems to offer good value on a centrally-located Waikiki hotel. With a brand name that means family, this Ohana hotel is intended to be appropriate for family vacationers; and bargain hunters are likely to find the cheap Hawaii vacation deals they want as well. Check Rates and Availability at Hotels.com (ad). Hawaii Vacations: Save 30% or more in paradise! : search keyword "Waikiki Wave". Don’t let the name fool you… the Aqua Waikiki Wave is not located within view of the surf. But it is just about 1.5 blocks away from the beach near the exact center of Waikiki. 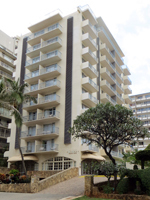 In addition, it’s close to shops, restaurants, and all the bustle of Waikiki. The Waikiki Wave is a nice, modern boutique hotel with retro-chic styling. It’s suitable for family vacationers and some bargain hunters (depending on the season). Check Rates and Availability at Hotels.com (ad). Hawaii Vacations: Save 30% or more in paradise! : search keyword "Ohana East". Like the other Ohana hotels, the Waikiki East is family-friendly and conveniently located near the exact center of Waikiki. It’s just one block away from Waikiki Beach near the Duke Kahanamoku statue and one of the best beginner surfing breaks in Hawaii. This hotel is well suited to family vacationers; and depending on the season, it could also be a great place for bargain hunters. Check Rates and Availability at Hotels.com (ad). Hawaii Vacations: Save 30% or more in paradise! : search keyword "Hokele". The Hokele Suites would have made my list of value-priced Waikiki hotels if the seasonal price fluctuation hadn’t been so drastic. I believe the sample rates* are indicative of the fact that this hotel is getting old and the guest rooms are fairly small – though many rooms include kitchens. Nevertheless, this property is now under the management of the Aqua Hospitality group; and that gives me hope that improvements might be in the works. 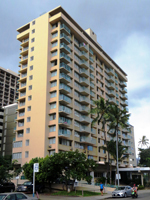 The Hokele is located approximately 2.5 blocks from the beach near Fort DeRussy Park and one block from the Royal Hawaiian Shopping Center. It’s well suited to family vacationers; and there are deals to be found by the bargain hunters. Check Rates and Availability at Hotels.com (ad). Hawaii Vacations: Save 30% or more in paradise! : search keyword "Coconut Waikiki". The Coconut Waikiki is a retro-chic Joie de Vivre hotel that directly overlooks the Ala Wai Canal and Golf Course with nice inland/mountain views. Although it’s approximately a 3.5 blocks from the nearest point on Waikiki Beach by Fort DeRussy Park, I tend to think that the location feels somewhat peaceful at the edge of the usual Waikiki bustle. The coconut is suitable for family vacationers; and it could also be seasonally appropriate for certain bargain hunters. Check Rates and Availability at Hotels.com (ad). Hawaii Vacations: Save 30% or more in paradise! : search keyword "Courtyard Waikiki". If you’ve ever stayed at any Courtyard by Marriott, then you know what to expect from this hotel. The décor incorporates Hawaiian themes, and the location is approximately 2.5 blocks from Waikiki Beach near Fort DeRussy Park. Otherwise, the experience is comparable to every other Courtyard you’ve ever visited. Everything looks new, clean, and modern. Unlike many Waikiki hotels, though, the courtyard has decent in-room work areas (for those who are unlucky enough to be here on business rather than pleasure). So I’d say this hotel is best suited for business travelers and family vacationers. Check Rates and Availability at Hotels.com (ad). Hawaii Vacations: Save 30% or more in paradise! : search keyword "Aqua Skyline". As far as I know, many (if not all) of the guest rooms at the Ilima Hotel are spacious studios and suites, complete with kitchens. But what makes this place unique among the Waikiki hotels… I’ve heard there’s free guest parking. If you’re going to have a rental car and be here for more than a couple of days, that could end up saving you hundreds of dollars! 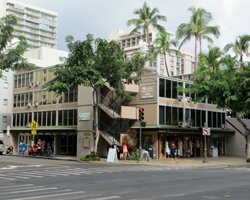 The trade-off, however, is that it’s two long blocks away from the Royal Hawaiian Shopping Center (then through the shopping center and past the Royal Hawaiian Hotel just to get to Waikiki Beach). But it’s just around the corner from the Ala Wai Canal and Golf Course, so you’re bound to have some nice scenic views looking inland. This hotel is well suited for family vacationers. Check Rates and Availability at Hotels.com (ad). Hawaii Vacations: Save 30% or more in paradise! : search keyword "Ilima Honolulu". Check Rates and Availability at Hotels.com (ad). Hawaii Vacations: Save 30% or more in paradise! : search keyword "Aqua Pearl". I’ve commented previously that I’m becoming a fan of the Aqua hotels due to the many improvements this local hospitality brand has been making – and the Aqua Waikiki Pearl is no exception. This centrally-located boutique hotel has been recently renovated – giving the spacious rooms and suites a clean and modern look and feel. 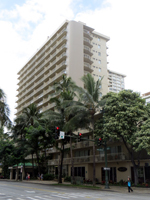 The property itself is located approximately a 1.5 blocks from Waikiki Beach near the Duke Kahanamoku statue; and it’s near numerous shops and restaurants. 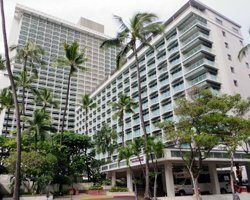 Because of the size of the guest rooms, I’d say the Pearl is well suited to family vacationers; and depending on the season, it could also be a great Waikiki hotel deal for bargain hunters. Check Rates and Availability at Hotels.com (ad). Hawaii Vacations: Save 30% or more in paradise! : search keyword "Shoreline Waikiki". 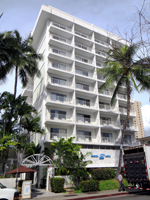 The Shoreline Hotel is a Joie de Vivre boutique hotel that was renovated in 2013. As a result, it seems to be fairly nice and modern. 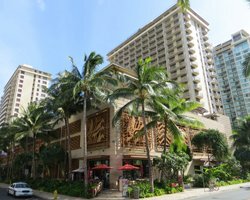 It’s located just a block from the shops and restaurants at the Royal Hawaiian Shopping Center (then a short hike through the same shopping center and past the Royal Hawaiian Hotel from the sands of Waikiki Beach). This Waikiki hotel is suitable for family vacationers; and bargain hunters may find that it’s worth checking for seasonal Hawaii vacation specials. **Due to change of hotel management, rates were obtained in February 2017 for the following dates in 2017: April 15-21, July 15-21, and October 15-21; and rates were also obtained for the following dates in 2018: January 15-21.